Sally Garland's evocative, customized illustrations honor the close companionships that enrich young lives. Of all the things one could wish for a child, the gifts of love and friendship are at the very top. Good relationships are the key to happiness—science shows it, and we all know it. 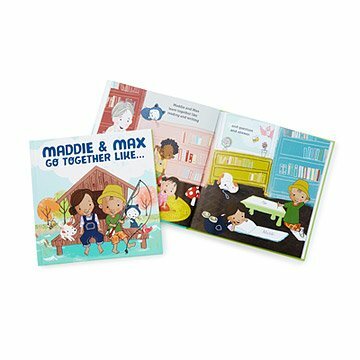 Our personalized We Go Together book celebrates the companionship of two children of your choice, whether siblings or pals, customized with their names, genders, skin tones, and hair colors. By comparing them to pairs of words like hello and goodbye, peanut butter and jelly, thunder and lightning, sunshine and rainbows, the book reinforces the lessons they're learning about the beauty of togetherness, without a single preachy note. Sally Garland's colorful images of the dynamic duo engaging in a wide variety of appealing activities also subtly gets across the wonderful feeling that the world is full of fantastic things to do and places to go... especially with your best companion. Made in Minneapolis, Minnesota. I am always looking for unique gifts for all the children in my life; friends kids, families children, siblings grandchildren. I had so much fun designing these as you have to find out their playmates names, or favorite colors, where they were born, which make the books very special. One dedicates the book to them also, so that is printed within the cover. I just love sending these at special times like Christmas or Birthdays. I bought this book for my nephew. I had hoped he would love to read a book with himself as a character. I was very excited to receive it, but very disappointed after reading it. It's not a story. It's just a bunch of sentences put together in a cheaply made book. I wish I would have been able to read it before buying it. Would have been nice to include given name AND nickname as an option to intersperse in the story. I got two copies of this book. One for my daughter and one for my nephew. Rae and Gray are so close and they will love reading their books with themselves and each other on every page! I love that little things in each picture have the names on it as well like the backpacks and books etc. super cute and well made! The customization is awesome. Made for a very special gift. Gave to my toddler nephew and he won't put it down. It's a Christmas gift for my twin nephews. I love the story. Just perfect! Great gift for a child you love! My niece loved that the book is about her and her sister! She loved this book. She plans on reading this book to her kids for many years to come!